The San Antonio City Council recently voted as part of its annual budget adoption to create a new $1 fee dedicated to park maintenance and increase current solid waste and environmental fees by 25 cents each. The fee increase reminds us how many line items comprise a CPS Energy bill, and how the requested 4.75 percent rate increase will affect just one part of the total bill: the base rate, or the amount customers pay per kilowatt hour of power they use. Only the line items in lavender will be affected by the rate increase. The service availability charge covers the cost of metering and billing for each address, regardless of energy consumption. The energy charge recovers infrastructure and operating costs for power plants, transmission lines, substations, distribution poles, overhead and underground lines, transformers, etc. based on the amount of electricity used that month. The peak capacity charge is added to customer bills to cover the higher costs incurred by CPS Energy when additional power plants are brought on line during summer months, when demand for energy is greatest. It also varies based on how much power is used. The fuel adjustment and regulatory charges are considered “pass through” charges. That means CPS Energy is passing on the costs — in this case for fuel, which fluctuates monthly, and regulatory fees — to customers. That’s because unlike a for-profit utility, CPS Energy rates may not recover more than what it costs to run the utility. The costs to run CPS Energy include operations and maintenance, debt service, the “repair and replacement” fund and payment to the city of San Antonio, which owns CPS Energy. The fuel adjustment charge makes up for the difference between what the utility allots for fuel within the base rate, and the variation in fuel costs and types actually used each month. CEO Doyle Beneby recently announced that, in the interest of greater transparency, CPS Energy will now publish the fuel adjustment breakdown on its website each month. Regulatory fees are those collected by the State of Texas to ensure the overall reliability and safety of the statewide grid. The natural gas rate includes a service availability charge and the energy charge. Then there are the fees placed on the bill by the city of San Antonio, including garbage and sewer fees. (These fees are only paid by residents within the city limits.) Again, CPS Energy doesn’t make money off them, it simply passes through the cost to customers, and avoids the costs associated with the City mailing separate bills to customers for these services. How do renewables fit into an “all of the above” energy strategy? 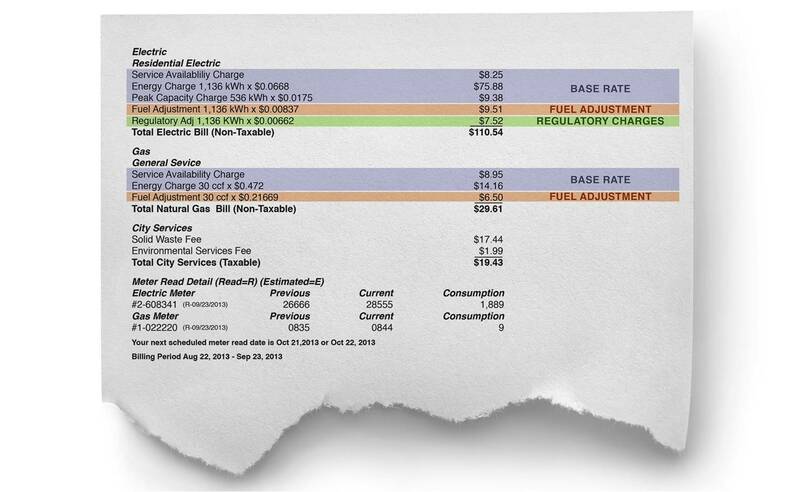 There is also a sewer service charge on the SAWS water bill. Oops. One is for trash collection and one is for sewage. Sorry.